A spa and an outdoor pool are among the amenities that lure our guests to the Luxe Hotel Sunset Boulevard â?? where you'll find all of the extras you'd expect from a resort plus the intimate service of a boutique hotel. Set on seven acres the two-story Luxe Hotel boasts a peaceful setting along busy Sunset Boulevard. Most of the 160 non-smoking rooms have private patios and up-to-the-minute amenities like iPod docks and flat-panel TVs with on-demand movies games and internet access. Surrounded by white umbrellas the heated year-round outdoor pool looks like the perfect location for a fashion shoot. As for eats your choices include poolside dining or an intimate table inside the understated restaurant. As for pampering the on-site spa offers a wide range of treatments. Valet parking is available for a fee. 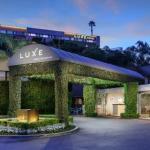 Off I-405 the Luxe Hotel is nestled between Beverly Hills Bel Air and Santa Monica. The University of California Los Angeles better known as UCLA is two miles east. The Getty Museum is 10 minutes away by car. Los Angeles International Airport is 12 miles south.